I love November. Sure, the weather is dreary and cold. People are grumpy and missing the sun, but it is sure is a great month for extra cash! Year after year, November is my highest earning month, mostly thanks to my annual cashback deposit from my Scotia Bank Visa Infinite card! 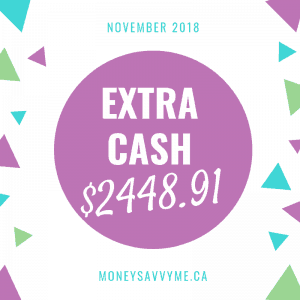 This year certainly didn’t disappoint as this November, I ended up with an extra $2448.91!!! This year’s total was also bumped up with some of my side hustles and the awesome Black Friday promo Shoppers had for my little guy’s number 1 Christmas Wish, the Nintendo Switch. Where did your extra cash come from this month? Please share in the comments!